The cover of Witness to a City. David Miller has written a book, but it’s not the juicy exposé we might have hoped for. Instead, his collection of stories, Witness to a City: David Miller’s Toronto, is more like Chicken Soup for the Torontonian Soul than the outgoing mayor’s memoirs. At Monday’s edition of This Is Not a Reading Series at the Gladstone, Miller sat down with former CBC reporter John McGrath to discuss his book and his political life. It was an easy crowd full of old friends, the kind who muttered the word “memories” at the mention of Miller’s initial bid for mayor. Miller held court, cracking jokes and talking his way out of the few probing questions that McGrath dared to ask. 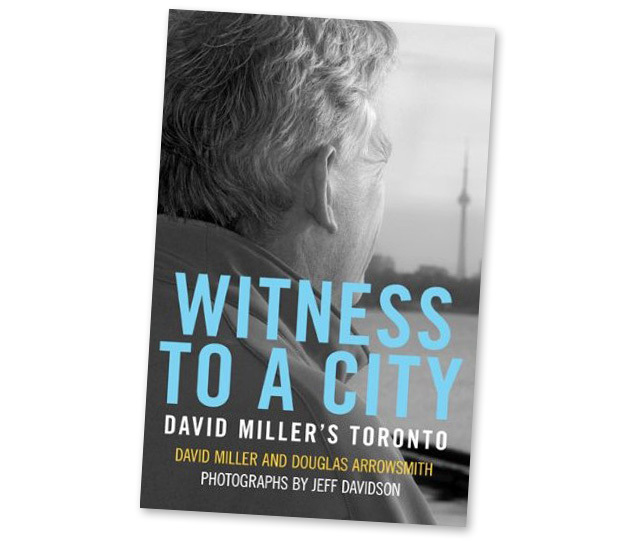 Miller co-wrote Witness To a City with Douglas Arrowsmith, a documentary filmmaker and adjunct professor at Ryerson. At under two-hundred pages, the book is a quick, light read. The language is straightforward and sometimes dull—but poetry’s not the point. The book begins with a short autobiography of Miller [PDF], from his childhood in small-town England to his mother’s struggle to support the family. Like a grad school entrance essay, he combs through his past for teachable moments and experiences that developed his “sense of social justice.” He tells a compact narrative that neatly explains Miller the mayor, but not necessarily Miller the person. Neither the book nor Monday’s discussion was a post-mortem on Miller’s time in office. He made general statements about his two terms, saying, “I’ve done and been the kind of mayor I promised Torontonians I’d be.” If anything, Miller is actively avoiding the tough questions and soul-searching that characterize most end-of-term reflections. Instead, he is setting down his vision of “Toronto” as an illustration of his own values. He said it himself when discussing the coming election on Monday night: “What should speak to [voters] is someone who’s running from the perspective that I have, because that’s what Toronto is.” Miller, as he sees it, is Toronto writ large. Indeed, that additional act may happen on Wednesday, when it’s expected that Miller will endorse his deputy mayor, Joe Pantalone. At Monday’s launch, Miller commended Pantalone for a comment he made in a recent meeting with the Toronto Star editorial board. When asked if the municipal workers’ strike had created Rob Ford, Pantalone replied that actually, it was the Star that created Rob Ford. Ultimately, Witness to a City is barely about Miller’s mayoralty—but it does set the stage for Miller’s future professional endeavours, which might explain the sometimes-dull writing, the loose collection of human interest stories, and the complete silence on the conflicts that marked Miller’s time in office.